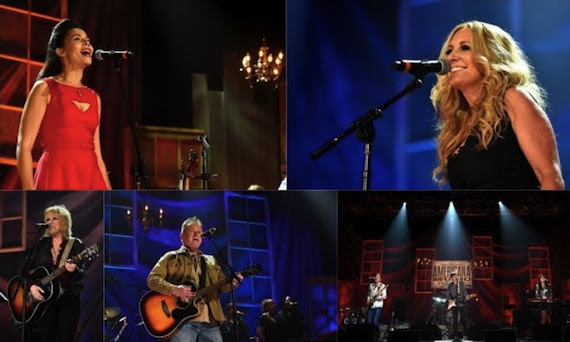 PIctured (clockwise, L-R): Rhiannon Giddens, Lee Ann Womack, Houndmouth, Don Henley, Lucinda Williams. 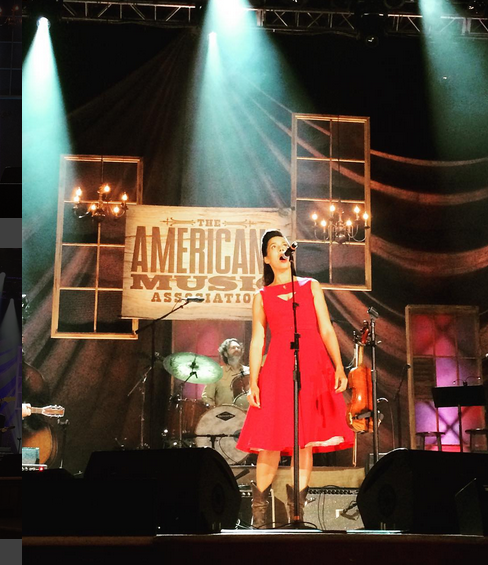 The cornucopia of music that was the Americana Music Awards is a memory that will linger far longer than the awards, themselves. Staged at the Ryman Auditorium on Wednesday (Sept. 16) before a sold-out crowd, the 14th annual AMA gig showcased gospel, bluegrass, rock, folk, blues, country and more during its three-and-a-half hour (!) event. Lucinda Williams (album), The Mavericks (group), John Leventhal (instrumentalist) and Shakey Graves (emerging artist) picked up trophies. The only two-time winner was Sturgill Simpson (song, artist of the year). He was not present. Lifetime Achievement honors went to Los Lobos (performance), Ricky Skaggs (instrumentalist), Gillian Welch & Dave Rawlings (songwriting), Don Henley (Trailblazer) and Buffy Sainte-Marie (Free Speech in Music). But it’s not the honors we have in our mental scrapbooks. It’s the performances. 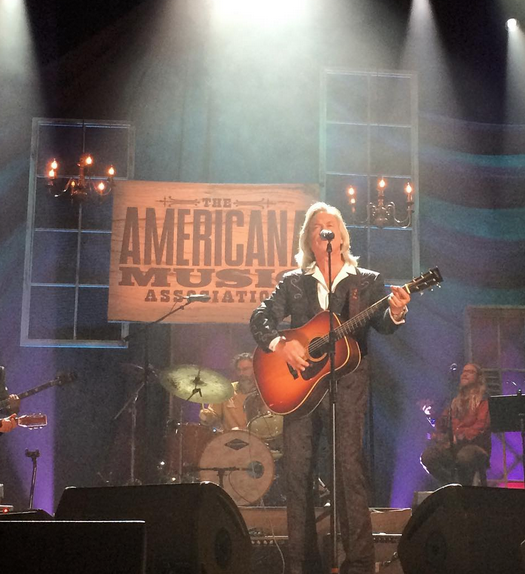 Host for the evening Jim Lauderdale performs during the 2015 Americana Music Awards. John Hiatt performed a moody and dreamily melodic “Long Time Comin’” with the awesome Ry Cooder in support. Keb’ Mo’ provided a tribute to the late B.B. King on the date of what would have been the blues legend’s 90th birthday. Rhiannon Giddens was riveting and super intense on “Round About the Mountain,” which drew a standing ovation. Stepping away from The Carolina Chocolate Drops has allowed her to really come forward as a vocalist. Nattily attired Doug Seegers gave the lilting melody of “Angie’s Song” a piercing yet hypnotic reading. My pets The Lone Bellow were fiery and soulful. Host Jim Lauderdale was churning and dramatic. Los Lobos rocked the joint with a chiming, jangling version of “Will the Wolf Survive.” Nikki Lane was a honky-tonk angel on “Right Time.” The Mavericks enthralled us with a richly textured and throbbing “Pardon Me,” complete with horns. One of the few duds of the night was the dirge-like “Short Haired Woman Blues” by The Dave Rawlings Machine. In its defense, the crowd loved it. I also could have done without the rather flat “My Cousin Greg” by Houndmouth. On the other hand, Ricky Skaggs, Ry Cooder and The Whites were hair raising and electrifying on the gospel classic “Over in the Glory Land.” At age 84, papa Buck White was smokin’ on the 88’s alongside such aces and Skaggs and Cooder. I love him. 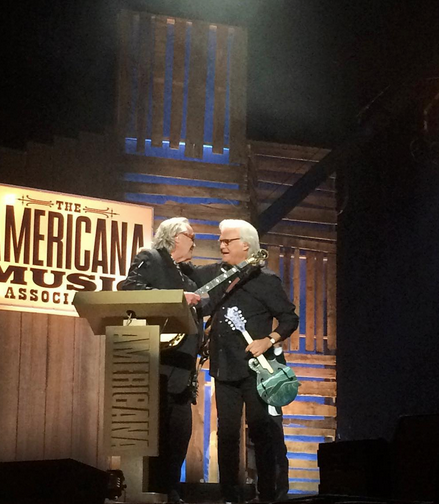 Ricky Skaggs is honored with the Lifetime Achievement Award as an instrumentalist, presented by Ry Cooder. He dedicated the new “Praying for Rain” to America’s small family farmers and to the westerners suffering from wildfires. Molly Felder of Swan Dive sang backup, as she does on Henley’s forthcoming Cass County CD on which the tune appears. The event’s finale was a rousing, rocking, celebratory rendition of “One Night, One Time in America,” an old Los Lobos favorite. Presenters included Rosanne Cash, Mary Gauthier, Mike Farris, The Milk Carton Kids, new Nashvillian Robyn Hitchcock, Sean & Sara Watkins, Jed Hilly, Rob Bleetstein and Jon Grimson. Working the room were such fabulons as Jon Freeman, John Lomax III, Jon Bream, Jewly Hight, James Burton, Geoff Himes, Jeremy Tepper, Jim Casey, Barry Mazor, Larry Nager, Tony Brown, Al Moss, Lucas Hendrickson, Craig Havighurst (who wrote the program bios), Luther Dickenson, Manuel, Dana Strong, Webb Wilder, Peter Cooper, Tamsin Austin (isn’t that a great name: she books country acts into performing arts centers and festivals in the U.K.), Tom Roland, Pat Embry, Doug Howard, Holly George Warren, Elijah Wald, Kristi Rose, Bullethead, Steve Lowry, Sherod Robertson and Eric Parker. The awards were the kick-off event of the AmericanaFest. More than 200 artists of the genre will be showcasing over the next four days at 3rd & Lindsley, The High Watt, The 5 Spot, The Basement, The Basement East, The Cannery Ballroom, City Winery, The Listening Room, Mercy Lounge, The Station Inn and Third Man Records.